6 foot tables is a great size for most settings. You can seats six comfortably in a variety of settings from restaurants to weddings and offices to rental parties. 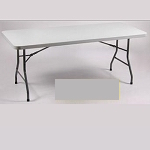 ATC plastic folding tables for sale with free shipping to the 48 States. 8-foot folding tables are well-suited for reception halls, schools, and churches. Atlas Tables and Chairs (ATC) manufactures a variety of chairs for commercial use designed for a variety of settings.